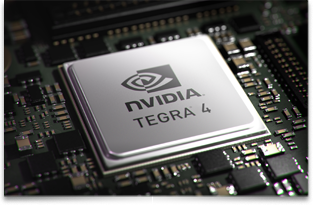 The NVIDIA Tegra 4 is an ARM-based SoC (System on a Chip) designed mainly for Android and Windows RT tablets and smartphones. It was formally announced on January 2013 and contains a quad-core CPU based on the Cortex-A15 architecture, a 72 core GeForce graphics card, a video engine, and a dual-channel DDR3L 1833 memory controller. It is manufactured at TSMC in 28nm HPL (low power with High-K + metal gates optimized for low leakage). The so-called 4-plus-1 processor cores are in fact five ARM Cortex-A15 CPU cores where the fifth core is used largely for power-saving purposes. As with the Tegra 3, this feature will not work with Windows RT as the four central cores are always active. The cores can be clocked up to 1.9 GHz (depending on the model, 1.8 GHz for T40S) and Nvidia claims performance levels above that of current high-end SoCs like the Apple A6, quad-core Krait or Exynos A15 dual-core. The integrated GeForce ULP graphics card (benchmarks) offers 72 cores that are still divided into distinct pixel and vertex shaders (no unified CUDA cores). Even so, the high number of cores should provide 6x the performance of a Tegra 3 and 1.6x the Apple A6 in GLBenchmark 2.5 according to Nvidia. Furthermore, the video engine has been enhanced and now supports 1440p VP8 and H.264 HP encoding and decoding. Some models will support USB 3.0 while all are expected to support e.MMC 4.5. Power consumption should be in the same ballpark as the Tegra 3 chip according to Nvidia. PRISM 2 color management can help save power by lowering display brightness without sacrificing viewability. Furthermore, the 28nm process allows for less power consumption overall. The models T40S and T40K are intended for superphones, tablets, and clamshells, whereas the AP40 and AP43 are intended for mainstream smartphones. Differences in maximum clock speeds and connectivity features (such as USB 3.0) are expected.